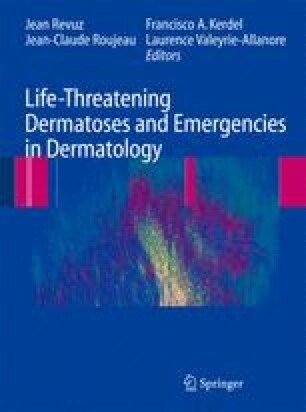 Life-threatening autoimmune blistering disorders include bullous pemphigoid and the different subtypes of pemphigus: pemphigus vulgaris, pemphigus foliaceus and paraneoplastic pemphigus. Major extent of skin and mucosal lesions results in the failure of main skin functions. Severe infections, including septicaemia and pneumonia and cardiovascular disorders, are the major cause of death in these patients. The aim of treatment is to stop the production of autoantibodies. Corticosteroids and immuno-suppressants are widely used in the treatment of autoimmune blistering disorders. New biologic agents such as rituximab are currently proposed for the treatment of the most severe, life-threatening types of these disorders.